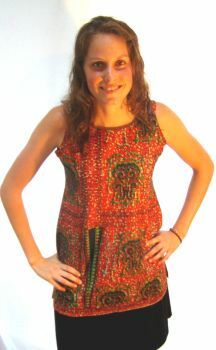 Sun Shirt is a fitted cotton kitenge shirt. The shoulders are two double 3/4″ wide straps. The bodice has 2 front darts and a slight flare at the hips. This is a bright, cool, shirt sure to draw attention. It measures 10″ from shoulder to shoulder and 32″ from shoulder to hem.